Pocket party game for adults. V R all cubes. All of us. V really R.
Dujanah community · Created a new topic Can anyone help me find the Caves of Amnahir? Thanks for your help. It seems my saves are safe. I believe I've partially figured out the issue. It seems there is some code in the binary that requires that the filename not be changed. The default filename is "Neon" for some reason. If you change it to "Neon Struct" the game will crash on launch. I still haven't been able to determine what is wrong with the icon. It was visible at some point but now it's not. Hmm... so I played the game for a while today, through several levels, saved and quit to come back to it later, and somehow the icon has disappeared again and the game once again crashes every time I try to open it. I did just update OS X to the latest version (10.14.2), but somehow I doubt that's related. Where are the saves stored? If I download the game again will I lose my saves? Thanks. Ah, sorry, I tried downloading it again and it worked this time. Also the first time the app didn't have an icon and used the default. Now I see the art. Not sure what happened. Ah, great, it works with Keka! I am on the same version of OS X (10.13.6). I was using The Unarchiver 2.7.1. Hey, I wanted to let you know that the Mac version 7z archive (1.0.2) is corrupted according to OS X. Let me know if I can help in any way to get this resolved. You were right, the app built once I commented out 'win64' in the platforms. The icon still didn't work, though. Just so you know, I went with an Electron app for my own project, but I am happy to help you troubleshoot the icon issue if you'd like me to. Hi there! Thanks for this rad tool! 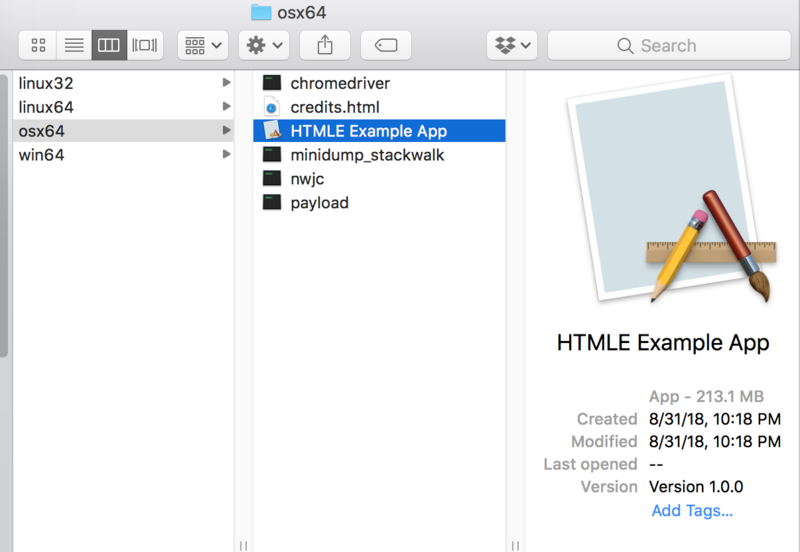 I'm having an issue building for Mac, both with my own app and with your example app. 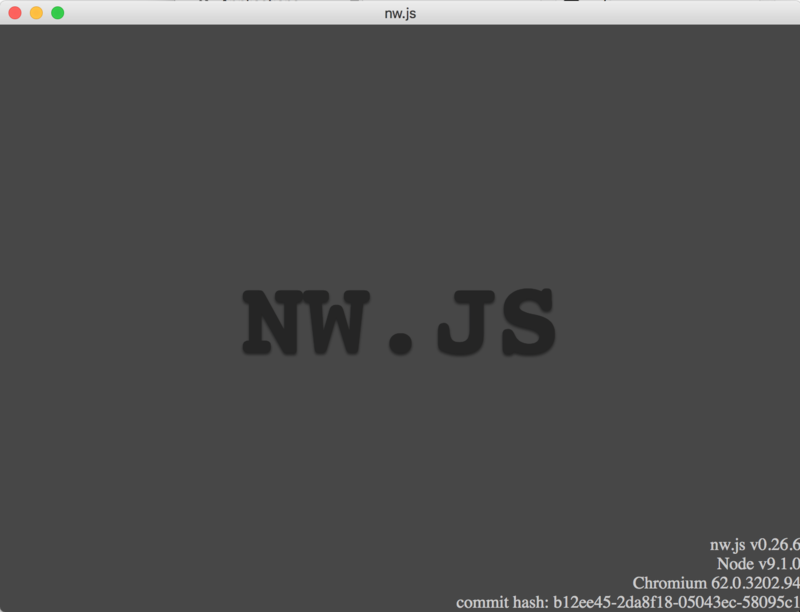 When the built app is launched, rather than showing the provided web app, it seems to show a placeholder/default nw.js page. It also seems not to use the provided icon. Any help would be greatly appreciated it! I don't think that's the problem. I can usually force it to open an app by right-clicking and choosing Open. The icon for little-world has a big 'no' symbol over it, which I've previously only seen with old apps that are no longer supported by the OS. You can't open the application "little-world" because it may be damaged or incomplete. Wow, very nice! Super polished. I was hoping at the end you would discover what was causing that sound. Anyway, liked it a lot. I dug it, but I was not able to find my friend. :'[ Art and animations were great. Agree some more variety could go a long way, and an animation for traveling up/down. Maybe some aural cues for getting close to lights (before it's too late) and/or your companion. Anyway, nice work! :D Thanks for the heads up on the Mac version. Amazing! I think this is my favorite game in the jam. Very nice! Feels really polished and full. Would love for there to be some more sound effects for different events! The art and animations look fantastic! Any chance for a Mac version? Nice cutscenes, and lots of variety. I also like the world map! Had some trouble with the combat system -- not sure if it was due to bugs or a lack of understanding on my part. Seems like this could be a really cool game though. Really like the art and UI design a lot!